Apparently, all my troubles started on August 5, 2013. I had been working for Royal Caribbean for only three weeks and we were docked in Ibiza. I had the day shift off – as did many of my coworkers. So, we all decided to go to Bora Bora Beach. There were about twenty of us – Youth Staff, Sports Staff, and Cruise Director’s Staff. I had only been off the ship a few times previously and I had never been to Ibiza. We all piled into cabs and shared rides over to the beach. We spent the day in the sun – and I got an incredible sunburn! While we were there, I wandered off by myself a few times to swim in the ocean or to pick up some water or snacks from a nearby bodega. It was late in the afternoon, and I had just returned to our spot on the beach from purchasing a bottle of water when I noticed something odd. Everyone I was with had left. Where did they all go? Apparently they went back to the ship. How was I going to get back to the ship? I had no idea. Then, I saw Joe. Joe Chambers, a member of the Cruise Director’s staff. He was packing up his towel and things as I approached him. “Where did everyone go?” I asked. “Everyone just left,” he said. “Let me go get my things, I’ll be right back,” I replied. I quickly ran over to the spot on the beach where my things were still laid out – surrounded by empty sand where everyone else’s stuff was just moments before. I gathered my things together and turned around. Joe was now nowhere to be seen. I ran towards the road. But I didn’t see anyone – not even Joe. I ran up and down the road. Nothing. I was lost. Very lost. 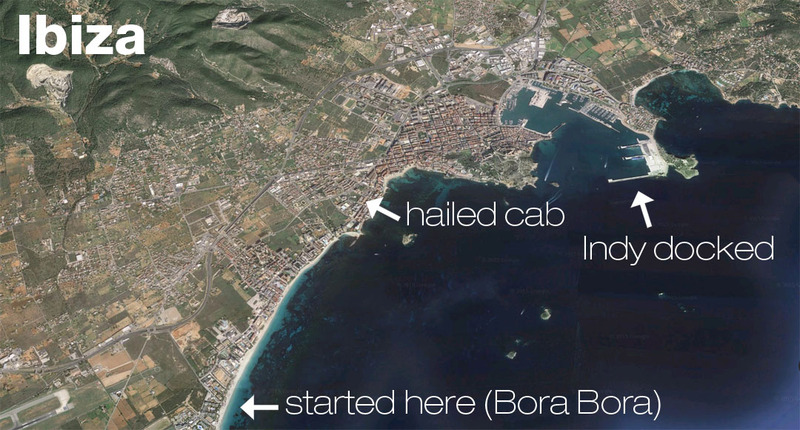 I don’t remember exactly how many Euros it had cost me to split a cab three ways to Bora Bora beach, but I do remember I had been careful to keep that much cash on me for the ride back. Unfortunately, now I had to take a cab by myself and I was going to need more money. I immediately began walking through the town looking for an ATM. Do you know how hard it is to find an ATM on a beach town in Ibiza? A lot harder than it should be, that’s for sure. I couldn’t find an ATM anywhere. I searched for nearly thirty minutes. Finally, I just started hailing cabs. In my pathetic, broken Spanish, I tried explaining I was lost and did not have enough money to pay for a cab. The third or fourth cab driver to stop for me ushered me in – apparently he could tell I was in trouble and wanted to help me. I was in a state of panic. This was painfully obvious. The cab driver knew I was looking for a dock. I knew muelle (dock) in Spanish. I also knew barco grande (big boat). But I didn’t know how to explain that I meant cruise ship. So, he drove up the coast looking for the port entrance where The Independence was docked. He even called a friend on the phone to help translate and look up where ship would dock on the internet. We entered the port a few times, but as you can see form the map below the marinas where we entered did not have a view of the Independence. Lost in Ibiza: Finding my way back to the Independence of the Seas. So, he drove all the way around the dock to the far entrance and dropped me off for the ship. He graciously accepted what little money I had on me. I apologized for not having enough and he seemed to indicate it was okay. When I walked up to the ship, I could notice everything was not okay. Something was very wrong. Applause erupted. I looked up and saw that the entire port side of the Independence was filled with people. Nearly every stateroom balcony and every port side railway was filled with people. Apparently, the Captain had announced that a crew member was missing and people were eagerly waiting to see if I would return before the ship set off. I arrived back at the ship before the scheduled departure time. But I arrived 10 minutes past the guest all aboard time and 40 minutes past the crew all aboard time. Side note: During my second contract, Royal Caribbean instituted a new policy that there are now no longer separate crew and guest all aboard times. Apparently, all the guests had boarded the ship before the crew all aboard time and the Captain wanted to leave the docks early. But he couldn’t leave early because one crew was still missing. Me. So, they “held the ship” for me. I was mortified. This was the first time I had had made a mistake at my job. And it was clearly my own fault, but I certainly felt betrayed and abandoned by my coworkers. I wasn’t abdicating responsibility to them, but in light of how it all happened, surely, I though, I couldn’t be too harshly punished. I was left behind. I wasn’t drunk. I wasn’t acting irresponsibly. I was just lost and had been abandoned by my crew mates. I was lucky I made it back at all! Royal Caribbean has a progressive disciplinary procedure in place, like many companies. It was nearly identical to the one I was accustomed to in the Air Force. If you make a mistake, you receive a Performance Opportunity Log (POL). This is a temporary documentation that doesn’t follow you from one contract to the next. If you make the same mistake more than once you receive a Verbal Warning. Verbal Warnings are documented and stay on your record for one year. If you have repeat offenses, you can receive a Written Warning. Those are very serious and can ultimately lead to your being dismissed. In fact, if you receive three Written Warnings you have to have a hearing before the Captain of the ship called a Master’s Hearing. At these hearings, the Master can decide if you are simply incapable of being trained and taught and can then dismiss you, or he can decide to give you one more chance, a Final Warning it is called. Well, for this particular infraction, my Adventure Ocean Manager, Matt Ducharme, skipped the POL and went straight for the documented Verbal Warning. I didn’t realize it at the time, but that documentation would prevent me from being considered for promotion or applying for a job in a different department of the company for one year from that date. So, that was pretty harsh, but I accepted it. At the time, in fact, Matt told me that he didn’t think I deserved a Verbal Warning. He said he wanted to give me a POL, but his hands were tied because the Staff Captain (2nd in Command on the ship who handles all crew and internal matters) had instructed him to give me a Verbal Warning. I didn’t have any problem with being punished. The only thing that really bothered me about the situation was that I felt really let down by my friends and coworkers whom I thought would have my back. I was especially disappointed in Joe Chambers for ditching me like that when he clearly knew I was left behind and helpless. Little did I know that this seemingly innocent Verbal Warning was the first procedural seed in what would eventually be my undoing. Little did I know that the continued pattern of coworkers stabbing each other in the back and hanging each other out to dry would largely contribute to this.